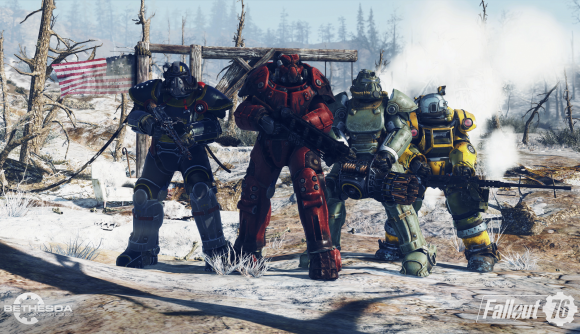 The existence of microtransactions in Fallout 76 have some gamers worried; you can't be too cautious in this age of Star Wars Battlefront II controversies. But in a recent tweet, Bethesda's Pete Hines assuaged fears that players who spend real money on the in-game currency will be at an advantage. While Atoms–an in-game currency for Fallout 76–will be purchasable with real money, the items available to spend Atoms on will be purely cosmetic. Character improvements come via Perk Cards, which are by leveling up in the game. When asked if Perk Card packs can be purchased with real money, Hines tweeted that they're only available upon leveling your character up. Fallout 76 features a map four times as big as Fallout 4, according to Bethesda. And with only up to 24 players occupying your world at any given time, running across another human player is not as common as some might think. So even if Atoms provided a gameplay advantage, the instances in which it would be useful are somewhat rare. You just get them when you level up. In #Fallout76, Perks are represented through Perk Cards. You earn them every time you Level Up. It’s nice to see Bethesda addressing microstransaction concerns head-on. Big releases without microtransactions are becoming a rarity, but Fallout 76’s seem mostly unobtrusive. Hopefully it stays that way.